When you make as many disaster movies as Roland Emmerich, a few things are bound to happen. One, the law of averages suggests you’ll eventually churn out something a bit rubbish that’ll be branded a “disaster” by a publication whose wordplay skills aren’t quite up to scratch. And two, it is likely customers will start to encounter genre fatigue. 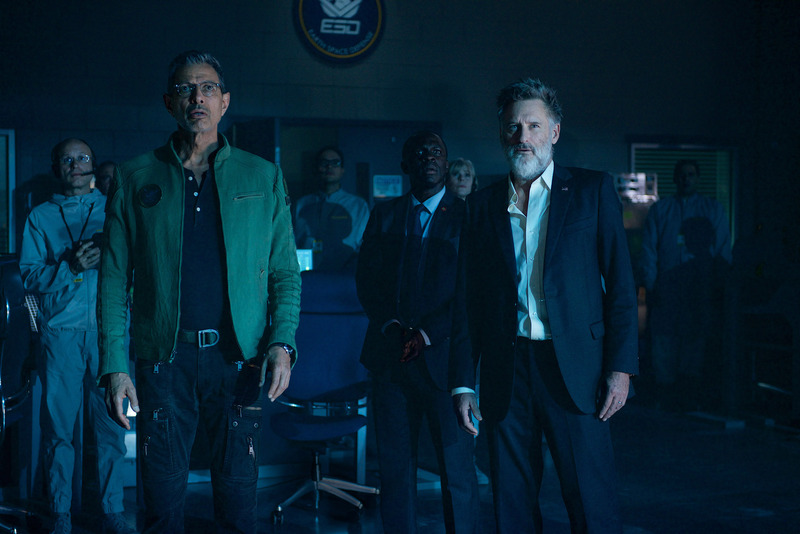 Independence Day: Resurgence is Emmerich’s sixth out-and-out catastrophe appraisal, having averaged around one every two years since 1996. And while it certainly isn’t a poor effort, it is a tired one. We’re 20 years removed from the events of Independence Day and humanity has taken significant steps towards protecting itself against future attacks. The Earth Space Defence programme operates from locations like the Moon, made habitable via good old militant colonisation. Jake Morrison (Liam Hemsworth) is one of those orbiting the Earth, a fighter pilot with skill and a cocky demeanour. He’s no Han Solo, but then Resurgence is no Empire Strikes Back. What the film is, though, is familiar, hitting many of the same notes as its predecessor only this time with crisper technical tendencies — the Moon base purveys that futuristic grey-silver Prometheus sheen. Hemsworth’s Morrison is a reflection of that sameness: a marketable replacement for Will Smith’s Steven Hiller, Smith either too expensive to rehire or personally fed up with sci-fi roles. Some of the familiar is good though. Jeff Goldblum, for instance, recaptures plenty of that self-aware wit he displayed as scientist David Levinson (now a lead Area 51 researcher) in the original. Whenever he appears the film lights up, freely recognising its silliness and gleefully bathing in it. “I heard his son is much more of a moderate,” Levinson says in reference to warlord Dikembe Umbutu (Deobia Oparei) before meeting with the commander’s militia, each fighter sporting high impact weaponry and a no-nonsense facial expression. It is the sort of snappy levity popularised for better or worse by Marvel cinema, but perfected by Goldblum whose poise and timing are, arguably, unmatched. However, just because the film is generally aware of its wackiness doesn’t mean it should skimp on an engaging story. Aside from its predecessor, Resurgence has more in common with White House Down than anything else in Emmerich’s portfolio, especially tonally. Both movies take would-be serious predicaments — an attack on the President there and an attack on the world here — and imbue them with carefree notes. There is no narrative weight, which is fine, but Resurgence doesn’t offer any alternative means through which stakes can conjugate. We have already witnessed a failed alien attack on this world and it’s not enough simply that the scale is larger this time around. The characters, though generally likeable, are as expendable as the other billion civilians squished by an enormous spacecraft docked atop half the globe. The manoeuvring of pieces often feels forced. Former President Thomas J. Whitmore (Bill Pullman), whom we meet in a state of mental anguish, evades his high-level bodyguard and appears on stage alongside the current President (Sela Ward). You can only fathom such a thing happening because the story needs it to. It needs to have a panicked Whitmore warn the world about incoming aliens and the only way to get there is through an unrealistic turn of events. While it is true these calamity blockbusters rely little on sturdy plot dynamics, the successful ones often find a way around that issue. San Andreas managed to distract from any story inefficiencies by dabbling in simplicity: hosting a handful of straightforward characters led by a charismatic force of nature in Dwayne Johnson. Goldblum could be that force of nature here but there are so many other players in the game, therefore everyone’s arc suffers and the overarching narrative is rendered a bit baseless. This issue comes to a head right before the third act: as Goldblum spews out waves of exposition, he might as well be reading from the Instruction Manual for Ending Disaster Flicks. 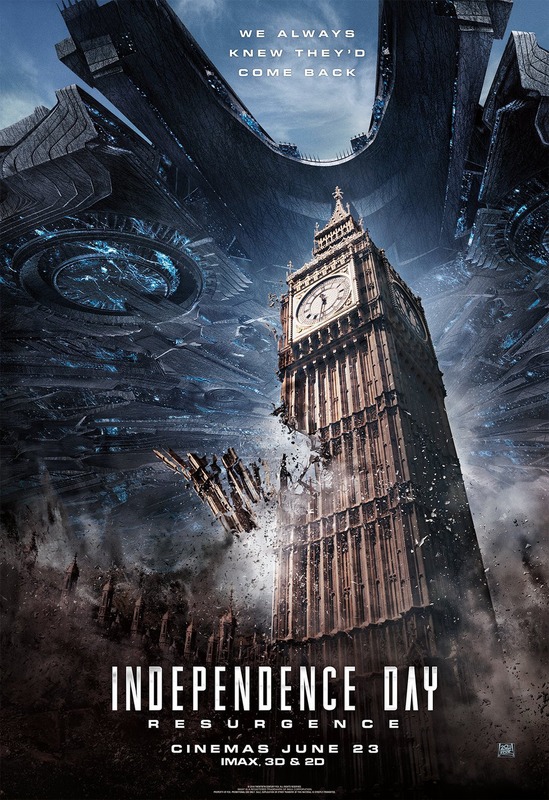 Emmerich and his squad of writers do try to reflect the catastrophic reverberations of the Independence Day attack in their characterisation of various individuals. Whitmore, as discussed, and also the returning Dr. Brackish Okun (Bret Spiner), fleetingly humorous as he ambles around excitedly looking for the next thing to shoot with a giant ray gun. It’s because these characters are played for laughs that the piece is unable to really delve into the emotional scarring they might be privy to. There is also an instance where you think the film might explore how said scarring has had an impact on the moral endurance of humankind: it involves military decision-makers and government officials debating whether to destroy a seemingly neutral ship. Alas, popcorny action stuff gets in the way. The brooding hum that plays in tandem with the alien mother ship’s arrival is an example of what could have been had the outing further tapped into its natural sci-fi/horror instincts. Another such flirting occurs later, when military men and extraterrestrials play a game of cat and mouse in a dark bunker. It’s essentially a scene from Alien or Aliens, only without the benefit of a creepily construed atmosphere. Clearly Emmerich had one eye on Ridley Scott’s work when making Resurgence given the alien mother looks like a cross between H. R. Giger’s Xenomorph and Smaug from The Hobbit trilogy. In 1996, Emmerich used scale models to achieve the level of bombast required to compel the cinemagoing public. While I can’t see too much that sets this sequel apart from its parent, there is something about the practicality of blowing up a mini White House that endears more than the admittedly impressive visual palette on display here. Maybe that sums up Resurgence: a film made with so much technical proficiency that it seems to forget about intuition, be it something akin to the scale model intuition that once charmed viewers, or the sort of narrative intuition that plants us in a recognisable world with new, engaging possibilities. It all feels too easily earned. “Vengeance must always be profound and absolute,” sneers a baddie at the beginning of Babak Najafi’s London Has Fallen, sequel to Olympus Has Fallen. That movie wasn’t particularly good, though it still holds superiority over its younger British sibling, which is a pretty damning indictment of Najafi’s effort. As it transpires, vengeance is neither profound nor absolute. What is absolute is London Has Fallen’s failure to assert any sort of moral vigour, and boy does it try hard. This is a film that begins with an American-led drone strike — the strike lands somewhere in the Middle East and kills a bunch innocent civilians — and then concludes with a lot of western brouhaha. Gerard Butler’s pretty good, mind you. An early morning jog unhealthily recants Captain America: The Winter Soldier, and London Has Fallen never really recovers. Why we find Special Agent Mike Banning (Butler) out jogging is a mystery anyway — this is a guy with an unpainted nursery room awaiting his handiwork at home. Banning is expecting a child with his wife, played by Radha Mitchell, whose limited screen time only marginally lags behind that awarded to both Angela Bassett and Charlotte Riley. The lack of time for the latter is a real shame given Riley’s sparky attitude imbues the piece with some much-needed freshness late on. Ah yes: the nursery. We watch as Banning does a bit of home décor, all the while hoping upon hope he won’t get called away from his family to serve President Benjamin Asher (Aaron Eckhart). And why should he be called? It’s not as if Banning is the President’s most trusted right-hand man. Only, he is, though not for long: Banning has his resignation letter typed and ready to send. Finally he will be free to live a comfortable life with his wife and future child. It’ll be grea– wait, hold on. The British Prime Minister just died. Big funeral. All heads of state invited. Damn, so close. And so we voyage across the pond, fingers crossed that the day will run smoothly. Of course, it turns out the Russian President can’t be bothered showing up because, y’know, Putin joke. Neither David Cameron nor Vladimir Putin are mentioned by name — the British PM is instead referred to as James Wilson, though the Russian President receives no such treatment. Prohibitive legalities taken into consideration, this random-name-generator approach infects proceedings with an early dose of second-handedness that the film really could do without. Elsewhere, it’s a case of broad strokes: the Italian PM is depicted as frisky, the French leader as fashionably late. In fairness, nobody is buying a ticket to see a screenwriting masterclass, but even the basic story formulation feels lazy. When it isn’t flip-flopping between watery thematic substance and vaguely racist punchlines, we get to sit through Secret Service meetings during which potential terrorist plots are dismissed far too easily. And absolutely everything is telegraphed: ominous brassy horns sound out as Banning details the President’s route through London, foreshadowing trouble with as much subtlety as a jumbo jet taking off. Then there’s the godmother conversation that reveals whose death is pending. This sort of blatancy leaves us with no dramatic handle to cling on to. There are a few decent things afoot. The London setting works as a familiar backdrop and it’s enjoyable seeing the characters race around the city. One shot especially stands out: as an air raid siren booms, the camera pans back from ground level towards the sky, its focus fully on Banning and Asher as they navigate ghost streets. Props should go to cinematographer Ed Wild and director Najafi for this brief juncture of inspiration. And when the piece refuses to take itself seriously, there is mild fun to be had (including one or two well-conceived action sequences). 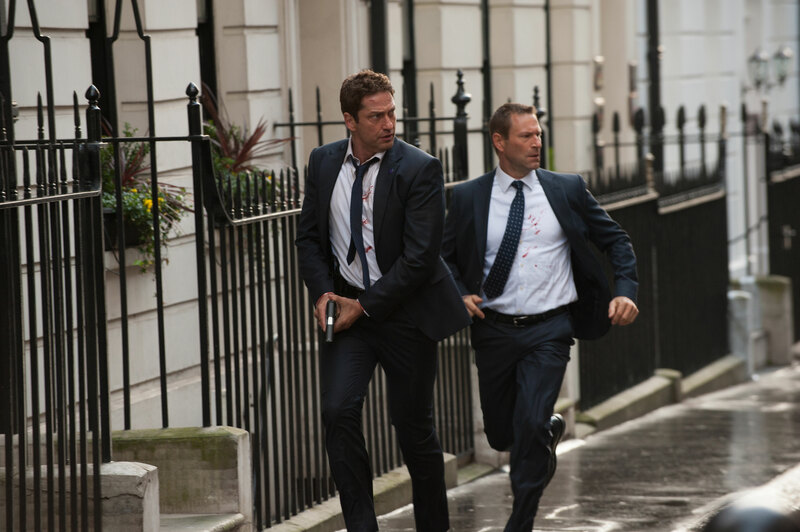 Rather than ill-judged attempts at joining the political conversation, London Has Fallen should embrace its silliness more. White House Down managed its limitations well, opting for nuttiness over seriousness with some success, and this ought to have following suit. We do see visual prowess, then, but ultimately there is no escaping the absurd special effects. A river blast looks like something out of a video game cutscene. A bridge collapses in Final Destination style (not London Bridge, oddly). And it doesn’t seem to be a case of hokey-on-purpose, but rather just poor visual integration. There is a disconnect between scene-setting shots, which take on a grainy quality hinting at realism, and silly-looking explosions. 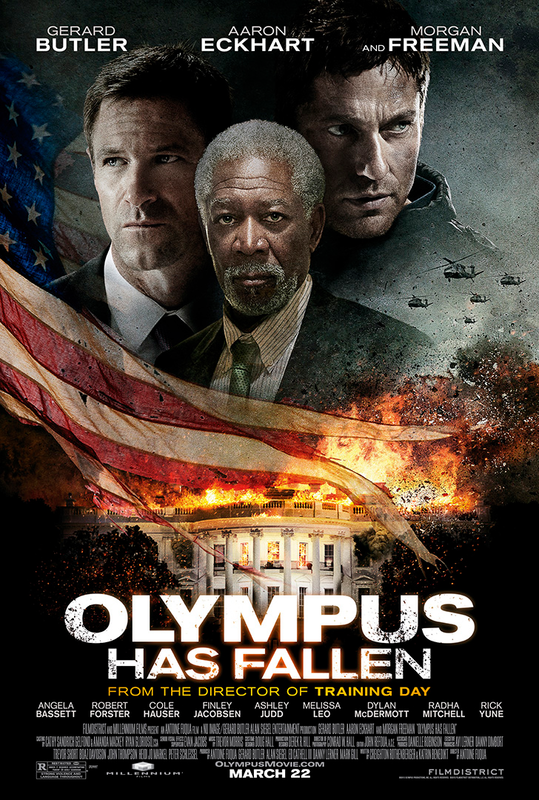 On a side note: at one point events fly stateside, to Washington, D.C. and to a White House that looks in tiptop shape following its destruction in Olympus Has Fallen. Somewhere, a plasterer deserves one heck of a raise. 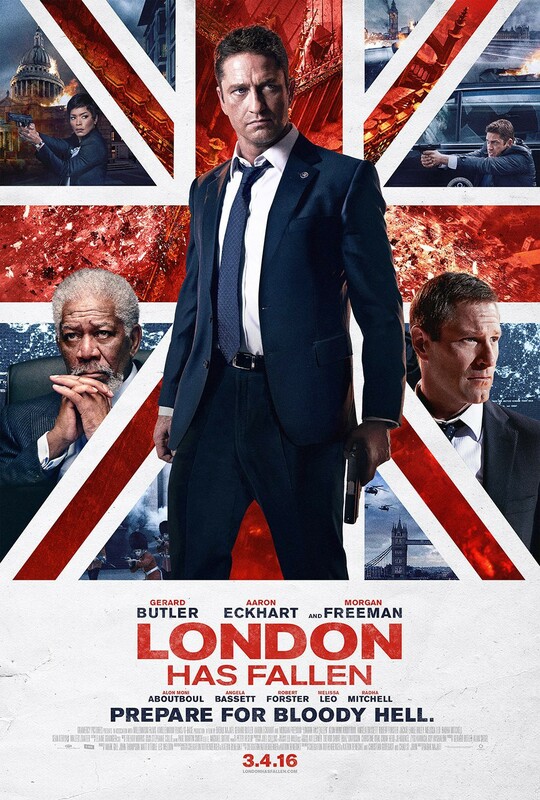 London Has Fallen unmasks the US President as damn competent with a weapon and then reckons it can contribute to the debate over the perils of modern warfare. The entire saga is far too flippant to get away with any of it: not the nervy and misguided faux-justification of terrorism via wheelchair reveal, nor its self-forgiving attitude towards unethical war. American Sniper suffered from a jingoistic eyesore and this evokes a similar blindness — it really doesn’t have a moral leg to stand on. If anything, you leave the cinema severely disliking everybody. Apart from Gerard Butler obviously. Have you seen him batter Jimmy Fallon with a giant hand? White House Down is bonkers. The President of the United States wears white trainers; kids can get through security with an easily obtainable Chocolate-Factory-esque ticket; Channing Tatum has an 11-year-old daughter. Madness. Indeed, profusely fun madness. Roland Emmerich’s film will never win an Oscar for Best Original Screenplay — or anything, truthfully — but at no point does it set out to. Unlike the director’s genre-relevant 1998 attempt at Godzilla, a film still languishing in a pit of sheer idiocy, his most recent action-packed attempt promotes an infectious need to have fun. 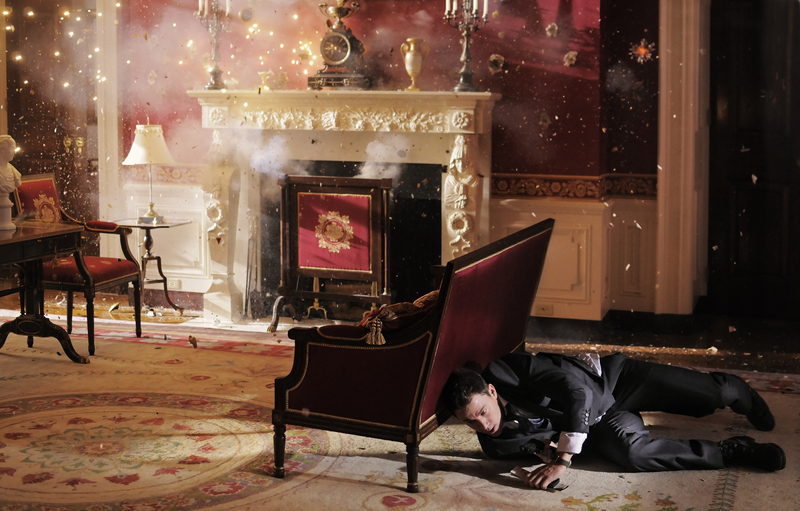 Spearheaded by a pair of goofy opposites, White House Down is more thumbs up. In the midst of a tour of the White House set up to appease his politics-loving daughter Emily (Joey King), John Cale (Channing Tatum) suddenly finds himself as the sole agent against a group of terrorist insurgents. The Capitol police officer, fresh off an unsuccessful job interview, must formulate a plan to shield the President (Jamie Foxx) from intended harm whilst also saving the many hostages in danger, one of whom is Emily. Perhaps unsurprisingly, this big budget summer popcorn bonanza is flawed. The screenplay written by James Vanderbilt sorely misses narrative intuition. During its predictably mellow opening act we can pretty much piece together the various components as the make themselves known on screen. In that dimly lit room over there is a shifty-looking group of janitors. Our lead has just been scorched for an insufficiency in trustworthiness. He missed his daughter’s recent talent show too. (She’s just popped off to the toilet alone.) Man, if only there was a way he could redeem himself. Wait, what is that sweaty, nervous chap doing with a concealed trolley? Those are only a handful of the film’s commonplace elements. This might be perfectly fine escapism, but it wouldn’t hurt to add a slither of acumen occasionally. Its unwillingness to deviate from the cookie-cutter norm aside, there are other issues. The fact that characters aren’t well-defined in general is likely a factor, but it should be noted that females don’t necessarily get a fair swing at things. Yes, Joey King’s youngster Emily is a girl who, on more than one occasion, displays intellect far greater than many of her male compatriots — Joey is great, by the way — but the significance is that she’s a child rather than a female. Maggie Gyllenhaal plays one of the President’s assistants and early on looks like she might be thrown into the action, but is told to go home before impact. (“And that’s an order.”) Two others are fodder for Tatum’s macho-cool father: Rachelle Leferve, criminally underused as Cale’s ex-wife, and Jackie Greary as his current partner, or something. It’s not brilliant, but then, character development takes a universal back seat. On a more positive note, White House Down is a heck of a good time. Foxx and Tatum are together throughout the vast majority of goings-on, their companionship a comedic revelation. The two couldn’t be more unbelievable as President Sawyer and would-be service agent, but the lack of realism is their collective selling point. In truth, Foxx plays Sawyer as a bit of a bumbling idiot who makes smoking jokes in a time of crisis and doesn’t know what YouTube is. It’s exceedingly difficult not to laugh out loud as he sticks his head out of a moving limousine, rocket launcher in hand. Often, Cale manifests as the saner of the pair, but he too gets in a helping of humorous quips. Both actors succeed at elevating the lazy script, at least in terms of its comical output. Their dynamic is utterly absurd but wholly endearing. Unlike its White House disaster counterpart Olympus Has Fallen, which fails because it takes itself too seriously, Emmerich’s piece is far more audaciously light-hearted. Discretion isn’t on the menu. We nod knowingly at Independence Day references, guffaw fully aware at pictures of a flaming White House and are reminded that bombs are dangerous by their accompanying rapidly booming theme song. But it’s easy to accept these inclusions that would otherwise incur a barrage of sighs, because Emmerich directs with energy and a carefree nature that is sort of charming. At over two hours the film bustles by fairly quickly and the director should be commended for ensuring that proceedings consistently retain a sense of alluring anarchy. One of the funniest moments sees a character throw the phrase “military-industrial complex” into the bubbling cauldron of crazy. Its flippancy is ironic and probably intentionally so. Though coated in numerous explosions — of which the film insists on singling each out, as if in confession — White House Down actually looks rather splendid. The visual palette is both impressive and excessive; fireballs erupt skywards from grandiose helicopter crashes, whereas on ground level Tatum and company fight it out in clashes layered with grittiness. It’s a testament to special effects team that high ocular consistency is obtained. Like Michael Bay, but entertaining. Roland Emmerich wins the 2013 big screen battle of American homeland threat by quite some distance. His film certainly struggles to engage in fresh ideas and lacks far too much in the depth department to be considered as anything more than surface splendour, but it’s never boring. There’s no high-and-mighty movement going on here; this is popcorn-chewing, Coke-Zero-slurping cinema at its tastiest. 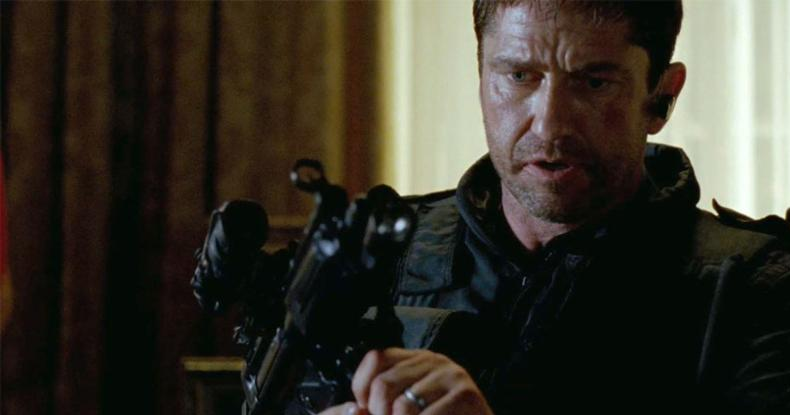 As far as attacks on the White House go, Olympus Has Fallen trudges its way across the vast lawn with a disappointingly uninspired plod. Bluntly, it’s a film that just doesn’t get much right. Antoine Fuqua’s take on the internal threat to homeland and presidential security saga struggles in areas where it should thrive — notably notions of simplicity — before subsequently becoming entangled in a tonal muddle as it oddly tries to venture into the faux-documentary realm without any conviction. The latter, coupled alongside some shoddy looking CGI attempts, creates a distinctly undesirable televisual shimmer; for $70 million it all feels slightly cheap. Without the macho zest of Gerard Butler, this may very well have been a complete disaster. The walking embodiment of a tragic evening in the life of both men, Secret Service agent Mike Banning (Gerard Butler) has been removed from Presidential protection duties as the mere sight of him rekindles harrowing memories in the fraught mind of President Asher (Aaron Eckhart). Now chained to a desk job in an office only a few blocks from the White House, the hardy soul is again summoned to defend nation and state as a result of terrorist infiltration. With the Leader of the Free World at the mercy of North Korean guerrilla forces and the very real prospect of US nuclear destruction on the table, Mike sees a chance not to simply become a hero — that’s not enough — but at redemption. Sounds reasonably straightforward, right? The age-old tale of man (or woman), pride and mind wounded, given the opportunity to reclaim fortitude and settle a previous score. Mike Banning’s journey epitomises this narrative. Heck, he even has the inherently restorative wife in his corner (she’s a nurse); their relationship strained by past decisions and Mike’s resultant self-serving of personal blame when there really isn’t any to be gobbled. Adhering to a well-versed formula is not necessarily a bad thing as long as the adherence is sincere and peppered with an occasional murmuring of intuition. Only, you’re more likely to find a needle in haystack than intuition around these parts. On one hand, the simplicity is executed sloppily, furnishing a sense of genericism over what could’ve been enjoyable modesty. Visual discrepancies bear the brunt of detriment here — the opening act is hampered by a flow of images that closer resemble the presentation of a video game than a Hollywood film. Later, drones waver around the sky without appearing fully embedded in the landscape, hinting at some sort of blending issue. The graphical inadequacies do sort themselves out when the action slows down and digital enhancement is dumped for more conventional techniques. Yet on the other hand, director Antoine Fuqua unveils vague ramblings of a documentary-style aesthetic. We often watch as labels appear inconspicuously beside characters on screen, each textual nugget informing us of the individual’s name and occupation. It chimes as an attempt to induce a sense of realism or to imply a degree of truth (because not much else is believable), but instead feels lazy. Boasting a portfolio of films including the likes of Training Day, Fuqua is evidently better than this. Narratively, we don’t get off on the best foot. Driving in blizzard conditions as horrendous as those depicted in the opening act hints at senselessness, particularly given the President of the United States is a passenger. Instantly there arises a lingering anxiety that this will only be the first in a long line of foolish happenings and, true to form, shortly thereafter a conveyor belt of outrageous decision-making is set in motion (at one point the order is given to shoot down aircraft over a busy Washington DC). Nonsense often generates humour, but in a film that preposterously takes itself far too seriously nonsense wholly reduces any semblance of sympathy for the characters on-screen, which is a pretty significant problem given the horrendous predicament that many find themselves in. Performances are almost universally uninspired, with the exception of Gerard Butler’s effort. As Mike Banning, Butler manages to inject a small helping of gusto whenever he is present on-screen and also during breaks from under-his-breath muttering. The role is ultimately one-dimensional but that’s no more than required, fuelling the simplicity fire. It’s also a dimension more than most of the other deliveries. As President Asher, Aaron Eckhart has very little to do other than conjure the occasional grimace which, incidentally, looks the same irrespective of whether or not he’s missing out on ice-cream or being held hostage by terrorists. Perhaps the most problematic character is Dylan McDermott’s Secret Service agent Dave Forbes whose moral dynamic flip-flops around more than a fish out of water. Female persons are inexcusably shunted to background; the likes of Radha Mitchell, Ashley Judd and Melissa Leo are less than secondary factors. Morgan Freeman ought to get back to be being God. Olympus Has Fallen unfortunately stumbles and falls from the get-go, struggling to regain any semblance of steady-footedness thenceforth. A decent Gerard Butler performance cannot prevent the inevitable stern wave of unnecessarily harsh undertones from washing away any potential puddles of fun. It’s not great.